Your degree is more affordable than you think. As a not-for-profit public university, our goal is to make your education affordable and obtainable. You have our word with our tuition guarantee, which means that once you enroll in a bachelor's or master's degree, your online college tuition rate is locked throughout your program, and will never increase as long as you remain in classes and in good academic standing. We also offer tuition planning for financial aid students as part of our admission process, so you can be sure that you have enough available funds to finish your degree. 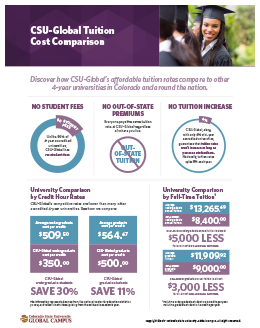 At CSU-Global, your online college tuition rate is what you pay. There are no additional student fees at any point in your academic journey. No out-of-state fees, no athletic fees, no per-credit fees, no additional fees period. Paired with our already low university tuition rates and Tuition Guarantee, this means that you will know your entire cost of education before you even enroll. There will be no surprises along the way, so you can focus on your education and budget accordingly from day one. We’re a military friendly school that appreciates the sacrifices military servicemembers, veterans, and their families have made for our country, and we are proud to offer reduced military tuition rates. We work with hundreds of corporations and other organizations that have shown a commitment to providing educational opportunities for their employees. See if your company is listed to get a discount on our already low tuition rates.